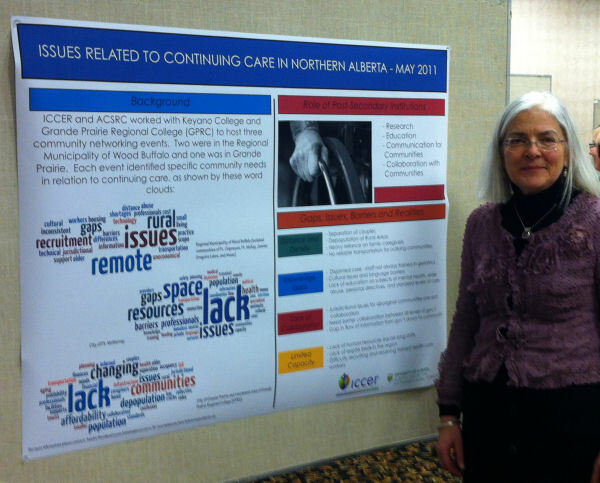 ICCER held focus groups in Edmonton, Calgary, Medicine Hat, and Lethbridge for the Community Needs Driven Research Project. We want to thank everyone who participated in a focus group or interview. Ethics approval has been received from the University of Alberta and the research activities at the Edmonton site for the "Optimizing Workforce Utilization to Inform Care Delivery in Continuing Care Facilities" study has begun. There will be an introductory session with staff followed by 6 staff sessions to discuss issues related to the four concepts of resident/family-centred care, collaborative practice, providers working to full potential, and staff mix. 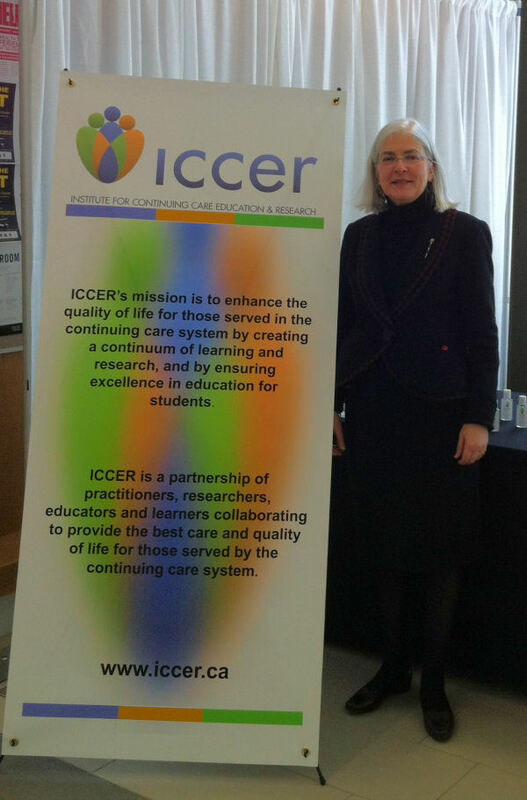 ICCER began work on developing the Community Needs Driven Research Network. Two reference groups have been established to guide the development - the Research Reference Group and the Needs Reference Group. Ethics approval has been received through the University of Alberta. In January ICCER and Alberta Health Services' Workforce Research and Evaluation Branch received funding from Alberta Health & Wellness to conduct a study "Optimizing Workforce Utilization to Inform Care Delivery in Continuing Care Facilities". Work is underway. Three continuing care sites are involved - two long term care facilities (1 in Edmonton, 1 in Calgary zone), and one supportive living facility (Calgary). Ethics approval has been received from University of Calgary and is underway at the University of Alberta. We successfully completed the first IntD410 Continuing Care stream course at the University of Alberta. We had 43 students from medicine, nursing, pharmacy, rehabilitation medicine, and nutrition. The facilitators for the class were from ICCER, CapitalCare, NorQuest College, and Excel Society. Each student team did a project with a continuing care facility. Each site had a different issue for the students to work on. This team worked with Excel Society, Grand Manor to identify potential risks for falls. 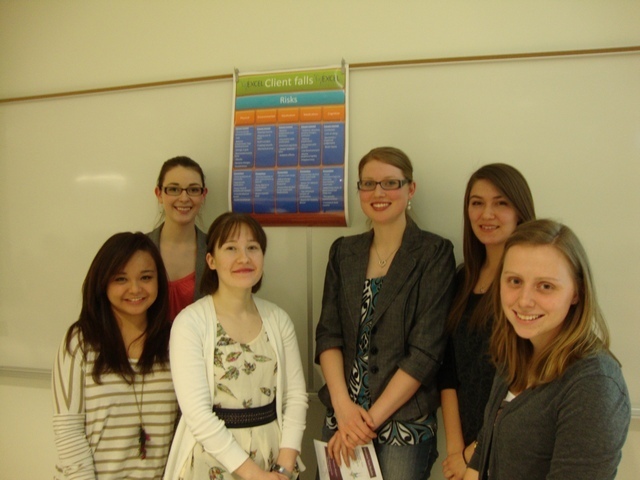 They developed a poster that Excel Society uses in both Grand Manor and Balwin Villa. Here is what the students had to say about IntD410 Continuing Care stream. ICCER was awarded a Strategic Initiative Grant from Alberta Innovates Health Solutions. Over the next year we will be developing a needs driven research network for continuing care in Alberta. For more details, see the project description. 1) Development of a Community of Practice for Allied Health Professionals in Continuing Care: Allied health professionals in the continuing care sector tend to experience professional isolation. Professionals such as social workers, pastoral care workers, and therapists of all nature make up a very small portion of the continuing care work force. For example, there might be one recreation therapist working part time in a long term care facility, or one pastoral care provider for one or more facility. This project will focus on bringing allied health professionals together to develop a community of practice. The group will work together on the CCD to discuss issues related to being the only one of their profession in the workplace. They will address professional barriers, and how to function on an interprofessional team without support from others of their profession. 2) Development of a Community of Practice for role definition of RNs and LPNs in Continuing Care: Representatives from ICCER organizations will participate in a virtual community of practice to discuss current and future roles of RNs and LPNs in the continuing care sector and how scope of practice for their disciplines will affect future role definition. The group will work together on the CCD to discuss current and future roles; how they see changes occurring; what effect role change will have on client/patient care; and other related topics. They will use the discussion forum on the CCD. Articles will be posted for review and discussion. 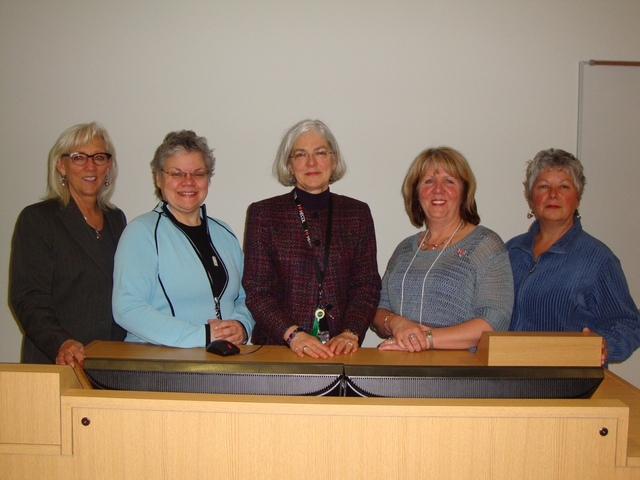 The wiki will be used to develop a statement of roles for RNs and LPNs in continuing care.